Interesting Choices is a recurring column that examines a decision point in a game, focusing on those that are particularly interesting. The point of the column is to examine what particularly makes each of the choices interesting, and the impact that this has on the game as a whole. The founding fathers are a particularly well implemented series of choices in the game, and Alexander Hamilton is a particularly appealing option for me in the current game. Since his benefit is increased productivity (for free!) at all settlements, and I've sort of settlement spammed the new world, I'll get quite a bit of benefit from him--essentially a free carpenter that doesn't eat, at each settlement, which I have seven of. At first glance, there seems to be little reason to say no, in fact. Why would I even consider it? To understand that, we've got to take a look at the system used to determine which founding fathers are available to me. First, there are a lot of founding fathers available. 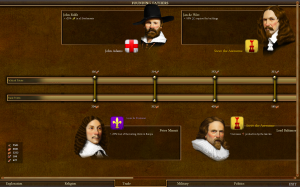 Here we've got John Rolfe, Jan de Witt, Peter Minuit, and Lord Baltimore. 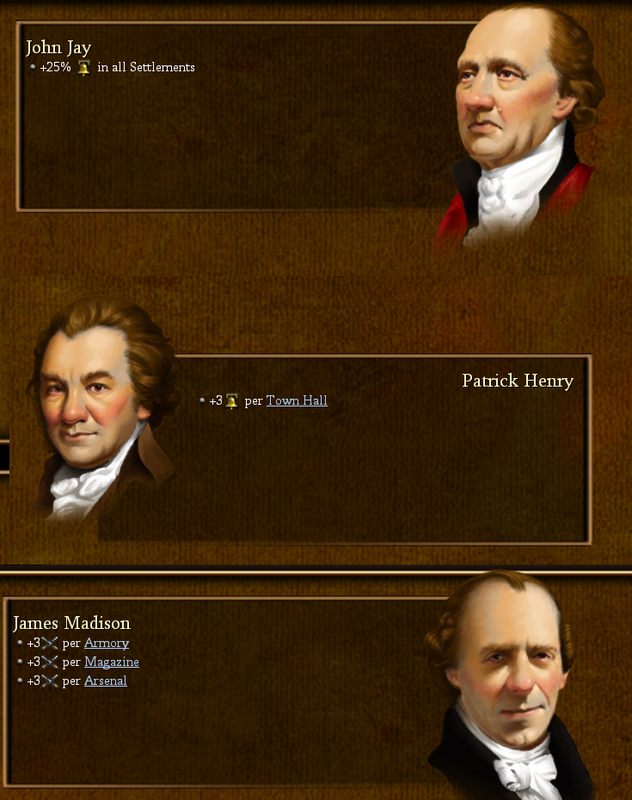 We can further see that each founding father has a (mostly) unique effect, which may be relatively meaningless to readers who have not played the game, and which are beyond the scope of this particular document. There is a scroll bar, indicating further options to the right. There are tabs at the bottom, indicating even more options with other specialties. Notably, we see that each of these four gentlemen are already spoken for. I've got the two on the right in my congress, and the English colonies have John Rolfe, while the French colonies have Peter Minuit. The important part of this: each founding father can only serve one colony, and once they're snatched up, they are gone for good. 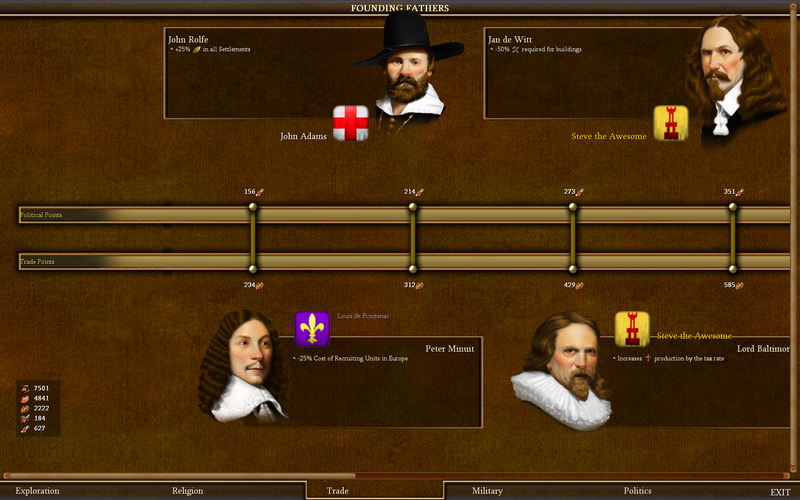 Across the center we have two progress bars, one for Political Points and one for Trade Points. These are earned through actions in game, and represent their own series of choices. The UI is perhaps a little bit less clear than it could be on this, but the head of each founding father lines up with the cost to recruit him. In the bottom left, there is a box detailing how many of each type of point I've collected at this moment in the game. It's worth noting that in addition to Political and Trade Points, I've also got Religion, Military, and Exploration Points. 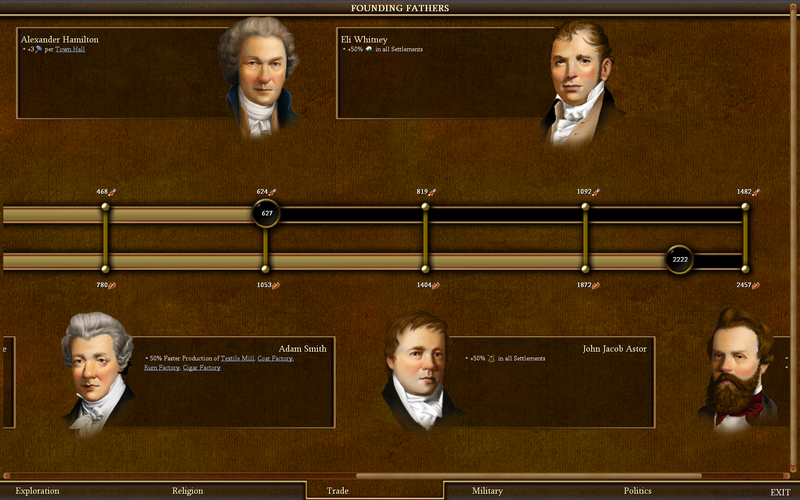 I've just passed up Adam Smith (faster factory construction), and will next have a shot at John Jacob Astor (more furs) and then Eli Whitney (more cotton). As I haven't focused much on cotton or furs, neither is particularly appealing (this game, anyway). However, Alexander Hamilton doesn't just cost trade points, he costs political points as well. This is true of all founding fathers in the game. 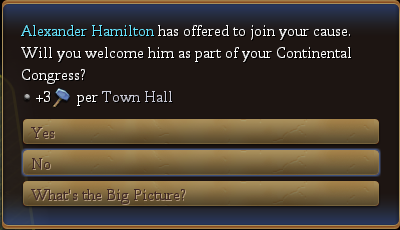 So recruiting Alexander Hamilton doesn't just diminish my chances of getting those other trade founding fathers before my competitors, it impacts my ability to recruit exploration, religious, military, and political founding fathers as well. Every time a founding father that interests me offers to join up, I have to carefully weigh the advantages he offers compared to the other founding fathers that I might be able to recruit (from any tab) in the near future. I also have to weigh the odds that another colony will recruit those other founding fathers first. I also have to weigh how much impact a given founding father will have if they are recruited by an opponent. Perhaps I want to play spoiler, and recruit Eli Whitney before the cotton-reliant French do. While I'm still hoping to snag at least one of them (Patrick Henry being my top choice), my chances to do so just took a serious hit. These three, being Political founding fathers, require only Politics Points, and I just spent a boatload of those recruiting Mr. Ten-Dollar Bill. As I continue this game, I may come to regret the decision I made with Alexander Hamilton. It wasn't an easy decision to make, and it may have been the wrong decision. The consequences of this single decision--good or ill--will be felt, perhaps, through the rest of this game, and that's enough to qualify it as an interesting choice from my perspective.